Both shorts will be set in Saga prefecture, and will highlight the prefecture’s culture. “Yakusoku no Utsuwa – Arita no Hatsukoi” will be set in the town of Arita, and will be a youth story highlighting the scenery of Arita. 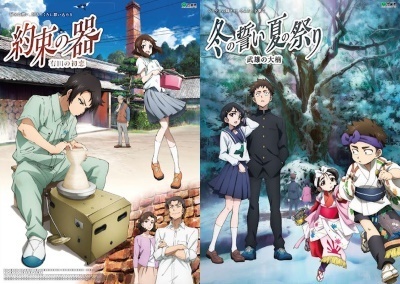 “Fuyu no Chikai, Natsu no Matsuri – Takeoshi no Dai-Kusunoki” is set in the city of Takeoshi, and will center on two characters, a boy and a girl, who grow up watched over by a large camphor tree that endures the time and seasons.